Enjoy inexpensive, accurate long-range target shooting with this 240-round case of ammunition from Winchester. 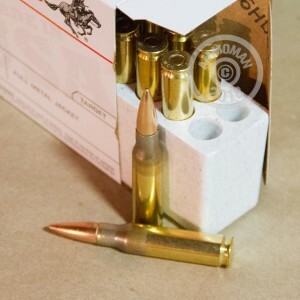 These mil-spec cartridges fire a 147 grain full metal jacket projectile at 2,800 feet per second and deliver excellent performance in bolt-action and battle rifles such as the Winchester Model 70, M-14, and FN FAL. This ammo comes in a pair of reusable, stackable plastic cans, each of which has a carry handle and latch perfect for portable storage. The 7.62 NATO cartridge is a powerful long-range round well suited to its current roles as a machine gun and sniper cartridge in the US military. Nearly as powerful as the .30-06 Springfield it replaced, the 7.62 NATO and its commercial version, the .308 Winchester, have also earned significant popularity among hunters and target shooters due to their excellent accuracy. 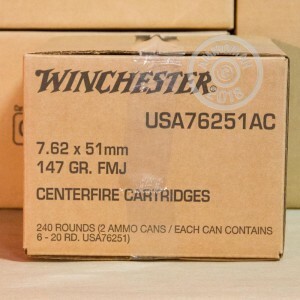 Of Course Winchester ammo is high quality. This is an extremely consistent product with great results. Other than outside elements no other scope adjustments made over a two day period. Great ammo!No problems with any rounds fired in my M1A1 Springfield... I would recommend this product and Ammoman!!! Great service, Winchester makes a great product. Excellent ammunition and awesome service from Ammoman. Ammoman always goes above and beyond. The produce is Winchester, enough said. 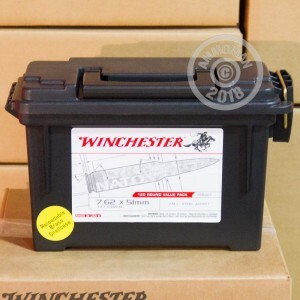 I can always rely on great quality from Winchester but, the most eye opening part of the transaction was the service and the speed in which the Winchesters got to my safe. I received a good price and didn`t have to pay for shipping or over wrap or handling.... Dam great place to do business. Thank you Eric. I've shot 150 of the rounds purchased and no ftf or fte at all and they are accurate as well.